Several accusations and allegations have been made about Kim Katami and Open Heart/Pemako Buddhism (OH) on Dharma Wheel (DW) forum as well as various buddhist Facebook groups such as Buddhism UK, Webcasts Buddhist Teachings and Contemporary Buddhism. Open Heart has also been denied the right to publish information about our dharma events on the aforementioned, as well as some other Facebook (FB) groups. Despite our attempts to communicate with the moderators of the concerned Facebook groups and DW forum, asking them to give us the same rights as other buddhist groups and/or to re-open certain locked threads (see a link below) and allowing a balanced discussion where the viewpoints of OH members are included, our pleas to reason have been ignored and our members censored. We have not been given our legal right to address the public accusations on the most popular mahayana-vajrayana buddhist discussion forum, DharmaWheel, existing today. This has left the presentation of views regarding Open Heart and Kim Katami faulty and lopsided. What we, as a group, signed below by many of our teaching staff and practitioners, want to do is to offer an alternative say on the matter. The claims on DW and FB include that (1) OH spreads false teachings, (2) that Kim Katami is a self-proclaimed guru and is purposefully being vague about the origin of the teachings and his lack of official authorization to teach, (3) that people interested in dharma should rather go to orthodox lineages for teachings, (4) that Kim claims to be more developed than the Dalai Lama, (5) that he is mentally ill, (6) that OH is a mix of religions and (7) that Open Heart is a cult and Kim Katami dangerous and (8) that because Kim Katami charges money for dharma teachings, OH is a scam. In this post we wish to respond to these claims in an effort to bring clarity and balance to the discussion. One of the most frequent claims is that the teachings are fake and that Kim is leading people astray. Although OH-teachings somewhat differ from orthodox methods in their external form, they follow and are based on the same basic principles of buddha dharma. It is not difficult to see this from the many publicly given teachings and lectures that can be found online. When it comes to verifying or falsifying any training system, orthodox or unorthodox, the only two ways for measuring are 1. empirical practical application or 2. clairvoyance that would allow one to see the purity or impurity of the teachings in question. If common practitioners wish to come to certainty about a method, they need to try it and see whether it has a dharmic effect on their mind (1.). Only highly evolved yogis have the ability of clairvoyance (2.) who, due to their mental clarity and fine tuned perception can instantly perceive whether teachings are valid or not. In tantric buddhism yogis and teachers in high positions are often consulted when some new teachings are taught by someone without formal training or recognition. Open Heart and Kim Katami has not yet had the pleasure of being investigated by His Holiness the Dalai Lama, the 17th Karmapa Ogyen Trinley Dorje or others in similar high positions. If we are ever given that opportunity, we will gladly accept it. 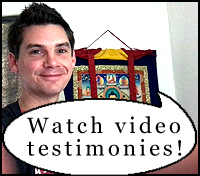 For us Open Heart-practitioners, who have experienced the benefits of the OH method, it is absurd to read some of the comments, such as "Kim Katami disseminates false teachings of buddha dharma" because we know from first hand experience how the teachings and exercises have had an immensely clarifying effect on our own minds and lives, including social relationships. investigated the teacher, nor the teachings for themselves. Additionally, they seem to lack the clarity to see past external forms, being caught up in opinions and dogmatic beliefs. Rejecting the teachings based on their external form makes no sense as the whole purpose of termas, revealed dharma teachings, is to ensure that suitable teachings are available for particular cultures, mindsets and generations. For example. The Two-Part Formula for awakening, a terma teaching revealed by Kim Katami, has been endorsed by well known traditional teachers from both Nyingma and Kagyu schools of Tibetan buddhism. The written endorsements can be found at the Open Heart-website and have been published with the consent of these teachers. In addition to this, other Tibetan buddhist lamas have stated Kim’s status as a tulku and a terton, but as they do not have enough authority and political power needed for an official recognition they wish to remain anonymous. It is also worth mentioning that many practitioners in Open Heart Sangha, an international group of about 70 people, have long histories in established buddhist traditions ranging from theravada buddhism, to mahayana (zen, chan) and vajrayana (tantric) buddhism. Some of our practitioners have received authorisations as teachers of traditional forms of buddhism. Similarly, it is often stated that Kim is a self-proclaimed guru who is purposefully being unclear about the origin of Open Heart teachings. To be clear, we reserve the term guru strictly for mahasiddhas or buddhas, i.e. fully enlightened beings. We call all our teachers, including Kim Katami, (because of his own insistence) teachers, not gurus or masters. It has always been out in the open that Open Heart is a terma-lineage and that although Kim has been requested to teach by physical teachers (although not by Tibetan buddhist teachers), the authorization to teach OH teachings comes directly from Guru Rinpoche and Yeshe Tsogyal. There has never been any confusion about this fact since Kim himself has always stated these matters openly. Of course, this is not something that we expect people to accept merely at face value. Kim has repeatedly said that the students need to verify the authenticity of the teachings through their own experience, never disregarding common sense and moral values. Accepting teachings without reason is not recommended by him or any of our teachers. What should be taken into account is Kim’s meditation training under the guidance of both his physical and nonphysical teachers. His life story tells that he started to have mystical visions, visitations of various nonphysical masters, and meditated, prayed and practiced yogic practices spontaneously, without anyone telling him how, since he was 3 years old. This continues even today. The first meditation practice instructions from a physical teacher he received at the age of 7 which he kept practicing 6 days a week until the age of 11. As a teenager he was formally introduced to buddhism, hinduism and meditation. For 8½ years (2003-2011) he meditated 8 hours every day without exception. He still continues his daily practice, joining events and retreats with various teachers on regular basis. There are many stories of treasure revealers/tertons who have been accused of being self-proclaimed teachers in a similar fashion as Kim. Fortunately, since the mark of an authentic teacher lies in the teachings themselves and their effectiveness, time usually has a way of separating the frauds from the authentic ones. It is said that people should avoid Kim and OH and look for established teachings instead. However, the notion that one would automatically be more safe, or that an authorized teacher would automatically be more qualified to teach is a mere assumption since the standards vary. There has been many harmful incidents of mental, psychological, financial and sexual abuse within vajrayana and all other forms of buddhism by teachers who were traditionally trained, authorised and widely endorsed by their peers. This should make it clear that the same amount of caution and common sense should be applied regardless of whether the teacher has authorisation or not. Furthermore, when titles, robes, doctrinal sophistication and the age of the lineage becomes more important than personal experience and sound judgment, one has forgotten what the teachings of the Buddha are about. The Buddha was clear in that all phenomena should be investigated within one’s own experience. This includes the expositions made by Kim and Open Heart, like it includes all others. Also for OH-students to have a proper view of buddhist teachings and practice, particularly vajrayana buddhism and dzogchen, Kim has openly encouraged Open Heart-practitioners to join events and retreats taught by teachers of established lineages. Even though we Open Heart Sangha members and teachers have chosen to follow Open Heart/Pemako Buddhism as our spiritual path, we fully respect the choices of other people in their decisions about their own paths. It is up to the individual which path he or she chooses to follow. Open Heart-practitioners have the same right. A common accusation is that Kim claims to have greater insight (higher bhumi progression) than the Dalai Lama and other buddhist teachers. This accusation is based on a misunderstanding of the Open Heart Bhumi Model (OHBM), particularly the lack of distinction between opening and perfecting of bhumis. Understanding this difference is crucial and has been clearly explained in our online materials. In 2016, Kim published a series of photographs of various well known, living and deceased, buddhist and non-buddhist teachers who he had stage mapped with the Open Heart Bhumi Model. As has been explained, stages, or bhumis (lit. grounds) of OHBM directly relate to the openness or closedness of subtle centers in the subtle body of man. Because all humans have the same energy body, OHBM can be applied on anyone, regardless of spiritual denomination, simply by subtle perception into the status of the concerned centers. Kim has publicly stated that this may or may not have correlation and relevance to how bhumis are viewed in mainstream buddhism. Bhumi study, conducted by Kim and the Open Heart community, has lead to the observation that each major shift (jap. kensho, tib. semngo tropa, awakening) in a sequential fashion opens the mentioned subtle centers located inside and above the head. Through this experiential study of several years we have validated the view that stages as presented in OHBM are correct, not only in the case of Open Heart-practitioners but others as well, due to the sameness of the subtle body. To date, opening of all 13 bhumis, as taught in Open Heart Bhumi Model, has been achieved by 15 OH-practitioners, not Katami alone. That being said, out of the 13 stages relating to the 13 energy centers, the 10 lower ones (bodhisattva bhumis) that store karmic impurities need not only be opened but also perfected. No one in Open Heart claims to have perfected all bhumis and therefore has not made the claim of being a living buddha. Nor has Kim claimed to be more developed than the Dalai Lama. The recorded Bhumi Study Series of OH practitioners that can be found online, measures bhumi openings only, not the perfection of them. The Bhumi Study Series is meant as a documentation of the increased levels of mental stability and clarity, not as a means of putting OH members or Kim Katami higher than others. Neither Kim, nor anyone involved in Open Heart has ever made unkind, negative or nasty remarks about His Holiness the Dalai Lama or any other noted buddhist teachers. As the published documentation in 2016 received so much negative attention and many orthodox buddhists interpreted it as highly insulting and negative, Kim decided to remove the articles in late 2016. Another often expressed unjustified comment, is that Kim Katami would be mentally ill or psychologically unstable. Those of us who personally know Kim find this statement to be without basis. Many of us, who have worked closely with him for years and have visited him and his family in his home on a regular basis, would characterise him as intelligent and stable family man. He is down-to-earth, not making a big deal out of himself, yet honest and direct when asked his opinion. No one in our group has ever witnessed a single episode of erratic or manic behaviour, or any other behaviour that would indicate some underlying mental illness, or abnormal emotional response by Kim. From the perspective of western psychology, looking at claims made by traditionally accepted teachers throughout the history, who frequently mention communicating with nonphysical masters and deities, visiting different realms and pure lands, narrating incidents from previous lives and so on, one would have to come to the conclusion that they are also mentally ill. Yet many of these people have offered teachings that have benefited countless beings, leading them towards liberation and freedom. It is curious that the same people who condemn these abilities in regards to some, fully endorse them in others. Again, the only way of judging whether someone is authentic (terton) or not, is to look at whether the (revealed) teachings work or not. There is no other way. Publicly calling someone mentally ill without any basis whatsoever is unethical, and in fact illegal in many countries. Somehow, the fact that Kim does not discriminate between masters of different traditions, is used to discredit him as a buddhist teacher. In this regard, Kim’s view is similar to those of many other buddhist teachers who give credit to the masters of other traditions and their teachings, stating that buddhism and other training systems do have the same potential. When separate traditions within buddhism, even within vajrayana, have produced living buddhas by using distinctly different methods, how is it so hard to accept that other religions could also have the potential of producing living masters? Anyone who has sufficient familiarisation of the natural state, knows that it is fundamentalistic to think that buddhism is the only tradition ever to have gotten it right. In fact, there is a growing number of orthodox buddhist teachers who think otherwise. During the last millennia, some Tibetan buddhist traditions have been somewhat successful in actualizing practitioners as buddhas, but to reject all other religions and masters is ignorance. There are numerous examples of non-buddhists who have achieved full or small rainbow bodies from Christian, Hindu and Taoist traditions, which is the ultimate attainment of the buddhist path. Open Heart is not a mix of religions, but a new and fresh expression of dharma. We do not reject any dharmic principles or masters that can help in attaining the ultimate goal of buddhism, even if it means breaking down the categories of buddhist and non-buddhist. Although it has not been stated directly on DW forum, it has been stated in other places that Open Heart is a dangerous cult. Looking into the spirit of the organisation, the community, and the direct statements of the head teacher and other teachers will instantly reveal that Open Heart is the exact opposite of a cult. All teachers and organisers have to agree to the Code of Conduct, which is included in the Open Heart/Pemako Buddhism Safeguarding Policy. The safeguarding policy, which can be found at the website, is based on the principles of honesty, non-violence, kindness and generosity and is written in accordance with the official guidelines of the NSPCC. We take these preventative measures seriously. Between the staff of teachers and organisers, we strive to keep the communication direct, transparent and open. During the existence of Open Heart (previously known as Samadhi Path) and Kim’s teaching career (since 2008), there has not been a single case of abuse from the current or former members of the group. Nor has there been any other kind of scandal in the group. Regardless of this, because we acknowledge the relative condition of human beings, including that of our teachers, OH has taken measures to prevent any cult like behavior within our organisation. Kim Katami has repeatedly stated that every person in the Open Heart Sangha is completely free to come and go as they please. It has been made perfectly clear that the students are in no way obliged or attached to the teacher, the teachings or the community. In the few cases where students have wished to continue their paths with different teachers, Kim has openly encouraged them for making a choice that suits them better. As mentioned above, Kim has encouraged his students to join the events and to read the writings of other teachers. This is hardly the behaviour of a cult leader. OH practitioners are normal lay people who live their own independent lives, have their own networks of friends and family, and live in their own respective countries. We think that it is conducive to dharma practice to live normal lives with jobs and social relationships. It is not recommended that Open Heart practitioners should leave their lives when becoming OH practitioners. Hypothetically, if any new student decided to abandon his or her normal life circumstances shortly after starting OH practice, our teaching staff would inquire the reason behind this sudden change. All of our members and teachers are encouraged to see other teachers, to look into other traditions and to keep applying common sense when it comes to dharma related matters and everyday life. No topic is taboo within the group and genuine critical questions are welcomed both in our live events as well as in our online community on Facebook. Anyone is as equally free to join the sangha as they are to leave it, at any time. Open Heart is a small independent group that is not financially supported by established organisations of the buddhist religion. Kim Katami is a full time dharma teacher and apart from the support of his students, he has no other source of income. He also has a family to support. He asks money for teachings because Westerners are not accustomed to giving dana. A donation based system was tried in our community years ago and it failed. Many Western lay dharma teachers have created similar systems so that the teachings can continue. The fees requested are according to the level of income of the individual. We operate with a sliding scale for course fees so people can decide how much they pay. Also, with every event there is the possibility of negotiating a lowered fee if necessary. No one has ever been turned away from OH teachings due to lack of finances. Open Heart/Pemako Buddhism encourages dialogue, healthy skepticism and common sense. Therefore, we welcome sincere discussion regarding our teachings, our organisation, our staff and other related topics. Yet, we cannot stand by silently and watch the defamation and character attacks that are taking place at DW and other places online, including Facebook. DharmaWheel and the mentioned Facebook groups, as widely used buddhist online discussion boards, have a responsibility in laying the foundation for open, healthy and ethical discussion regarding buddhism. Despite of the appeals by Open Heart Sangha members, expressed in politically correct and kind manner, we have unjustly been denied our right to respond. Therefore, it is sad to see that the moderators of these forums are breaking and ignoring their own terms of service, the very rules they themselves have set down in order to secure enlightened and fruitful discussion. We sincerely hope that they will see the validity of our reasoning and contemplate their responsibility in the ongoing dialogue, which includes allowing us to exercise our right for free speech and expression, and the freedom of religion openly on buddhist boards as they allow all other eligible groups. The treatment we have recieved has been nothing short of religious discrimination. As a concluding remark, we wish to make it clear that the primary purpose of this text is not to distribute blame. Nor is it to convert people to beliefs of any kind, or to put ourselves higher than anybody else. We simply wish to clear up some of the misconceptions about our group so that we can be allowed as equal participants in the open dialogue of the dharma community, and thus make our contribution to the common welfare of the greater sangha of all sentient beings. Thank you for reading.